This powerful storm is forecast to develop Tuesday in the Rockies, where it will rapidly intensify and bring blizzard-like conditions to the Plains on Wednesday. Winter storm watches are already posted for parts of Wyoming, South Dakota, Nebraska and Minnesota. Arctic air will dive south, bringing frigid temperatures and possible blizzard conditions for portions of the Rockies, Plains and even Great Lakes. 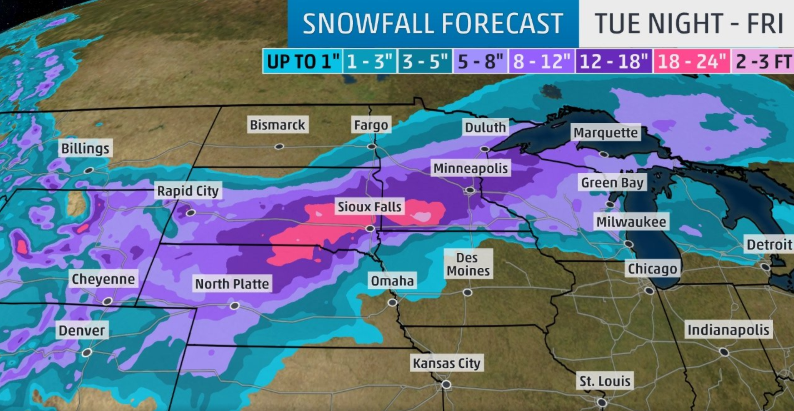 Up to 18 inches of snow will be possible with wind gusts of 45-50 mph in the Dakotas, along with white-out conditions. Even if the forecast models are wrong and snow doesn’t arrive, there will be significant amounts of wind and rain with increased flooding in an are area already attempting to recover from a “bomb cyclone” just three weeks ago. In addition to snow and/or rain, tornadoes, large hail, and damaging winds are likely with some of the storms.